Enough gaming and partying; Back to FooD! “Fugu” (Blowfish) is famous even among the Japanese as a high class food item. Because it contains a highly toxic poison in its internal organs, only chefs with a special license are allowed to prepare it. Fugu season is the cold period which is from about October to March, and the best time to eat Fugu is during December to February. If you want to try Fugu, you should definitely go to a restaurant during that season. The most popular style of fugu is the sashimi called “fugu-sashi”. It is known for being sliced so thin it is almost transparent. When arranged on a large decorated dish, it looks like a piece of art. 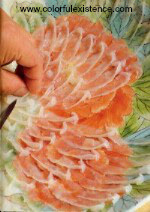 Sliced Fugu is typically arranged in a circular shape to look like a large flower blooming. However, some chefs are known to try to compete for the best arrangement style, presenting the fugu in the shape of a crane or peony flower. This is adorned with a mix of ponzu (a citrus based sauce) and momiji oroshi (A food item made from grated daikon and chili pepper. “Momoji” means maple tree, and refers to the red color of the condiment because the maple tree turns red in the autumn, and “oroshi” means “grated”). 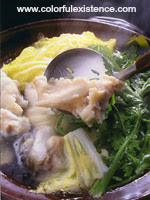 “Nabe” (Japanese steamboat dish) is also a popular way to enjoy Fugu. Together with vegetables like Chinese cabbage (hakusai, or bok choy in Chinese) and “Negi” (Japanese chives) and other ingredients like tofu and mushrooms, chunks of Fugu meat are simmered in a soup stock made from items like kombu (kelp). Usually when the soup is almost finished, waiters/waitresses add rice together with seasonings to make a kind of rice porridge called “Fugu zosui“. One of the most treasured parts of the Fugu is the roe eggs. 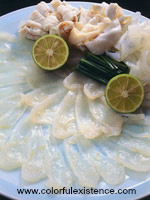 And some people even say that the melt-in-your-mouth texture of the milt of male Fugu is the best in the entire world. Although it is a little high priced, but if you have the chance, you should definitely try some. Also, the perfect companion for a Fugu meal; “Hire-zake”, which consists of Fugu fins that are fragrantly grilled and then placed in Japanese rice wine, has a mellow flavor that you cannot experience with other types of rice wine. Some people even feel that the name “Fugu” in Japanese is related to the word “fuku”, which means “happiness”. Enjoy a moment of happiness with fugu cuisine. Invoking the Unclean The Versatile Blogger Award! WIsh I tried it when I went to Japan, but my parents were skeptical so we didnt :/ Have you tried it before? How does the sashimi taste? I’ve had Fugu many many times! The Fugu Chefs here in Japan are really VERY well trained so there’s nothing to worry about, trust me. 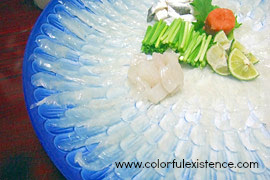 As for the Sashimi, it has a melt in the mouth texture, although it tastes quite plain on it’s own. But together with the other condiments and seasonings like ponzu etc..; It’s awesome! That’s the beauty of Japanese cuisine, it’s not just one item that does it. It’s more like the way how everything blends well and compliments each other. You really should try it one day, it’s an experience that shouldn’t be missed! What would you as define expansive delicacies? Being a master sushi chef can take an you entire lifetime. It’s more of a lifelong commitment, and nothing will ever be perfect in their eyes.